Basements have come a long way from when they were used exclusively for storage. Now, basements are frequently finished and used as spare bedrooms, game rooms, and exercise rooms. But one aspect of basement remodeling and repurposing that sometimes gets neglected or forgotten is adding a bathroom. While it may not seem like a big deal to have to go upstairs to use the bathroom, it can make spending time in your (expensively) finished basement a major inconvenience. Thankfully, installing bathrooms in basements can be easily done with the help of an experienced contractor and plumber. However, there are unique challenges to adding bathrooms to basements, so it’s important to be aware of those potential pitfalls before you begin the process. Adding bathrooms to other areas in your home is a much more straight-forward process compared to adding a bathroom to your basement. Because basements are typically partially or completely underground, they will require specialized plumbing and other unique considerations to function properly. 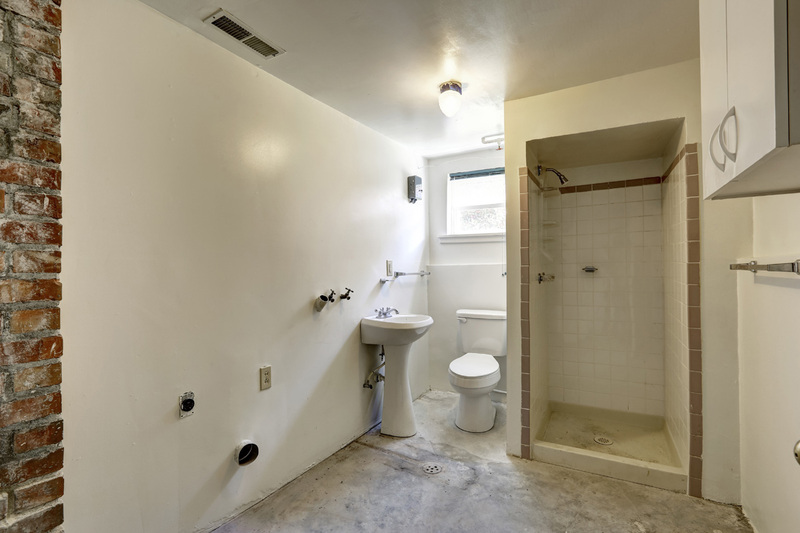 Will the bathroom be located near existing plumbing and wiring? The best location for a basement bathroom is one where it will already be close to existing plumbing and electrical wiring. Positioning the bathroom directly underneath an upstairs bathroom is ideal for making hookups as easy and effective as possible. Do you need a shower or tub? Unless you are planning on converting your basement into a full-fledged bedroom and living space, you should be able to get away with just adding a toilet and sink. Adding a shower or tub can create a headache when it comes to keeping the bathroom clean, as basements are often musty and prone to mildew, making them bad places for showers and tubs. Is your sewer line deep enough for easy drainage? Plumbing in above-ground rooms and floors uses gravity for drainage. But basement bathrooms may be located too deep for gravity to assist the drainage process. If your sewer line or septic tank is beneath your basement level, you may not need any extra work. But if the plumbing lines aren’t deep enough, you may need to excavate part of your basement to allow proper drainage. Do you need a special toilet? Even if your home has drainage lines that are deep enough for a standard basement bathroom installation, they may not be deep enough for a traditional toilet to work properly. In that case, you may need an alternative solution, like a pressure-assisted toilet, an upflushing toilet, or a composting toilet. Got Questions about a Basement Bathroom? Contact Us Today. It’s important to get an expert’s opinion before you proceed with installing a bathroom in your basement. At Aqueduct Plumbing, we can assist you with every aspect of the project, from planning and designing to building and maintaining. Contact us today by dialing (281) 488-6238.